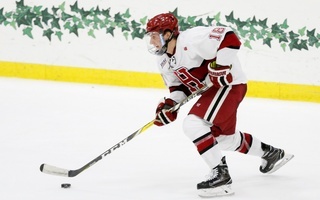 Pictured above, defenseman Wiley Sherman will look to anchor the Crimson’s defense against Northeasern. 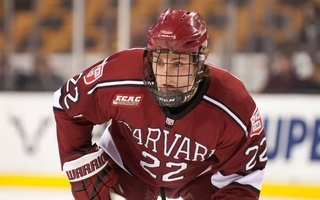 The last time these two sides met in the first round of the Beanpot, Harvard lost to the Huskies 6-0. The format of the annual Beanpot luncheon is nothing out of the ordinary. A coach and a captain from each of the four participating schools say a few words on behalf of their teams, then graciously wish their competition the best of luck. Eventually, Devin Tringale’s turn to speak arrived, and the Harvard men’s hockey co-captain pulled out a written speech at the podium. 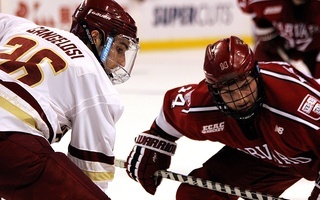 Boston College captain Chris Calnan couldn’t help but smile. Leave it to the Harvard guy to put pen to paper. But can you blame him? The Medford, Mass., native was just trying to get his speech right, much like the Crimson is trying to get this tournament right. Because even though it takes just two victories to capture a Beanpot championship, that particular section of Harvard’s trophy case has been collecting dust since 1993. Back then, only one member of the current Crimson squad had been born. Current associate head coach Paul Pearl was in his first season behind the bench of a college hockey team, working as an assistant at the University of Connecticut. And head coach Ted Donato ’91 was halfway through his 35-point rookie campaign with the Boston Bruins. The point is, it’s been a while. And Harvard knows it. 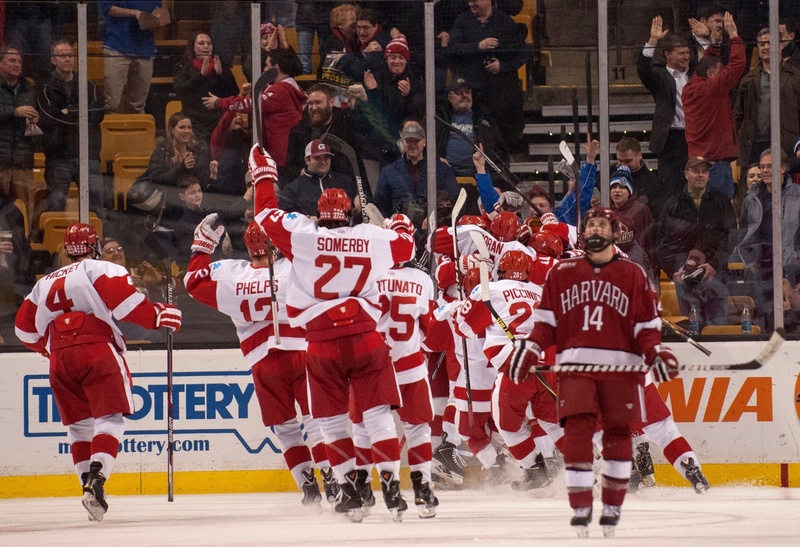 Harvard has lost eight straight Beanpot openers, including this double-overtime heartbreaker to Boston University in 2015. That thinking doesn’t fizzle with age. In fact, Tringale said he still gets a pit in his stomach when thinking about the Beanpot. And the players around him—regardless of where they come from—likely do too. Because while Boston’s ultimate hockey tradition may be arcane, once you arrive on campus, it’s easy to figure out what’s on the line. Northeastern captain John Stevens brought forth a similarly grounded tale on Monday, indicating that when the Huskies won their first Hockey East championship in 28 years last March, the response was “Congrats, that’s great, but when are you going to win the Beanpot?” Meanwhile, Boston University legend Jack Parker, who coached the Terriers for 40 seasons from 1973 to 2013, called upon the words of Jack Kelley, his coach during his playing days with the Terriers, to echo a similar sentiment. While Kelley’s motivational words still prevail today as an above-average rallying cry, they carried their full weight back when the Beanpot was, as Parker put it, the “epitome of college hockey.” According to the former coach, some national championship games would draw as few as two to three thousand people, whereas attendance for the Beanpot at the old Boston Garden would hit capacity at 13,909. “No one was drawing a crowd like this for a college hockey game,” he said. Of course, teams now have countless opportunities to play in front of big crowds, and a change of venue from the Old Garden to a much more modernized arena has perhaps done more harm than good. But make no mistake. Hockey fans in Boston still have the first two Mondays in February circled on their calendars. 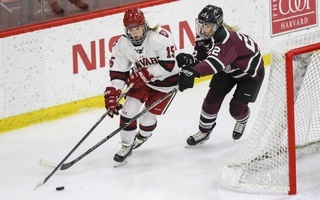 After playing a league game against Dartmouth on Friday, Harvard (14-5-2, 10-4-2 ECAC) will kick off the tournament Monday afternoon at 5 p.m. against Northeastern. These teams also met in the first round of the Beanpot back in 2014, when the Huskies hammered the Crimson by a 6-0 margin. Harvard’s seniors haven’t forgotten. 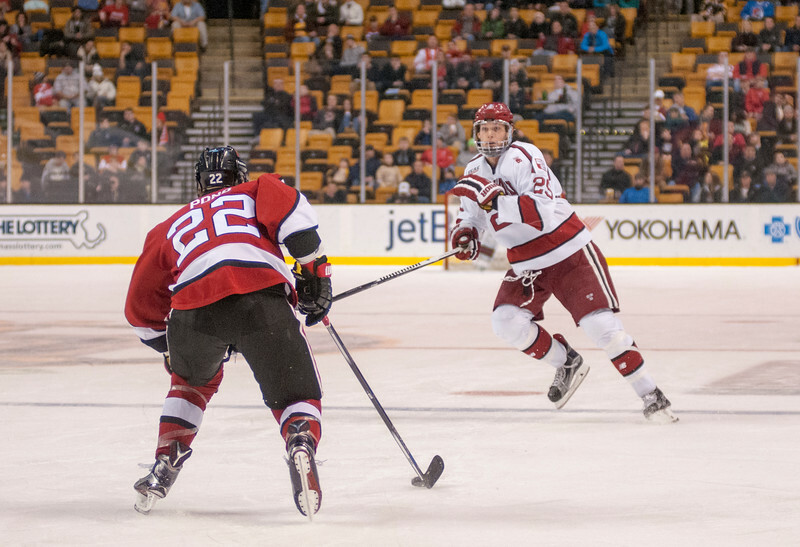 Harvard and Northeastern last meet in the consolation game of the 2016 Beanpot, as shown here, where the Huskies won, 5-1. Harvard enters this opening-round date with Northeastern head and shoulders above where it stood three years ago. Then, the Crimson had six wins through 20 contests. 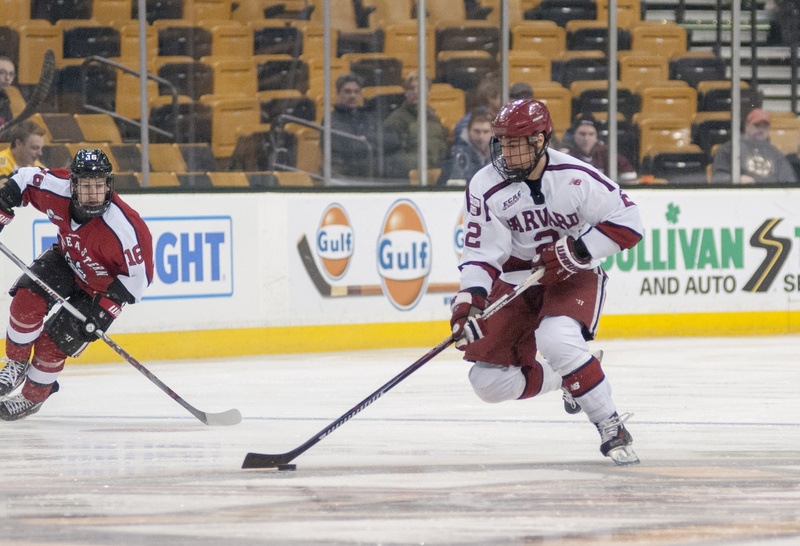 Now Harvard ranks fifth in the country, having earned wins in two-thirds of its games. Therefore, it’d be reasonable to call the Crimson the favorite to reach the championship game the following Monday—a place Harvard hasn’t been since 2008. Yet, while the Crimson did receive a favorable draw, Northeastern—much like last year—is currently playing its best hockey. Led by two of the country’s top-five scorers, Dylan Sikura and Zach Aston-Reese, the Huskies have won four straight games since opening the season 7-10-5. It will then be up to whoever emerges victorious to take down the monopoly on Beanpot championships located along Commonwealth Avenue, as either BC or BU has won every single title since the Crimson’s last conquest in 1993. But both Harvard captains say they’re ready for the task at hand. —Staff writer Jake Meagher can be reached at jake.meagher@thecrimson.com. Follow him on Twitter @MeagherTHC.